Pre-installed metal pan-flashing design for use with roofing sealant based installation. Welded and painted flashing joints for strength and durability. The new innovative Pick&Click! ™ brackets make blind installation a snap! 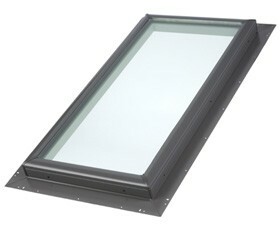 Every QPF skylight comes pre-installed with Pick&Click! ™ brackets that allows for fast and easy installation of sunscreening blinds and accessories. * White laminated glass - Tempered, laminated safety glass with a white coating to provide diffused lighting (Contact us for availability and pricing). * Blackout Blinds – Blocks the light. Available in solar and manual versions. * Venetian Blinds – Accurate glare and light control. Available in the manual versions. * Light Diffusing Blinds – Diffuse the light and eliminate glare. Available in solar and manual versions. The QPF skylight comes with pre-finished white frames that eliminate the need for secondary high cost trips by a painter. Integrated gaskets drain condensation to the outside. The QPF skylight comes in a variety of sizes that work with rafter or truss roofs, so that you can select the one that is right for your project. For details on these sizes, please download a copy of our Residential product sizes.